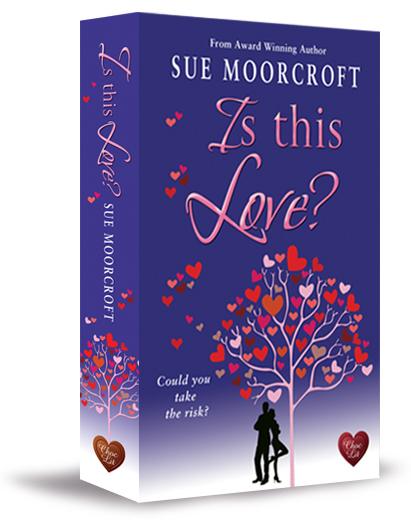 Today I am interviewing Sue Moorcroft and giving away a copy of her new book. I write novels of dauntless heroines and irresistible heroes. I also write short stories, serials, articles, columns, courses and writing ‘how to’. I’m a creative writing tutor and a competition judge. As you can see, I like to keep busy. I was a little late learning to read and write, owing to interrupted education, but once I ‘got it’ I found I adored both. I was part of an army family so home was where the barracks was. I was born in Germany and lived also in Cyprus and Malta. I’ve lived in England since I was ten but I still love to travel. I also love reading, writing, Formula 1, yoga, Zumba, my family and friends. Is This Love? has just been nominated for the Readers Best Romantic Read Award. Love & Freedom won the Best Romantic Read Award 2011 and Dream a Little Dream was nominated for a RoNA in 2013. 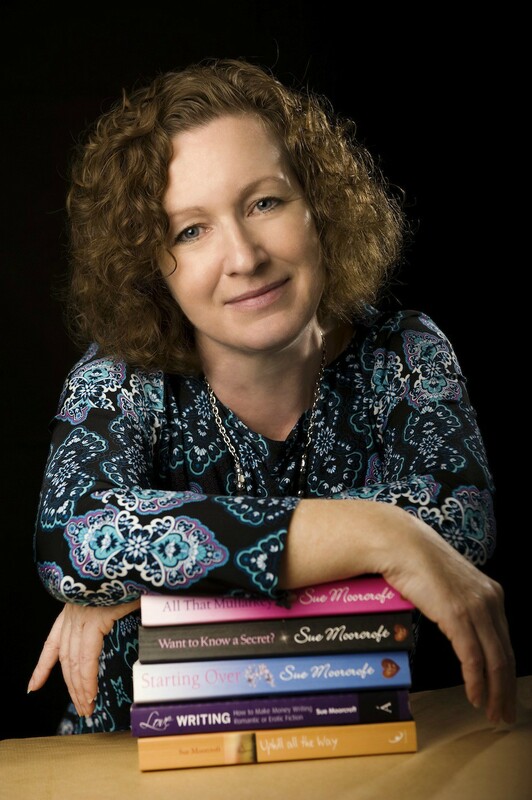 I received three nominations at the Festival of Romance 2012 and I’m a Katie Fforde Bursary Award winner. I’m the vice chair of the Romantic Novelists’ Association, which is good for being invited to publishing parties, and I edited the Association’s two short story anthologies. 2. What is 'Is This Love?' about? It’s about the different types and qualities of love. Not just the romantic phwoarrrr kind of love but the love Tamara Rix has for her family, in particular her sister, Lyddie, who, after a hit-and-run accident when she was a teen, needs more care than most adults. The book begins when her teenage sweetheart, Jed Cassius, returns to Middledip village to tell the Rix family who was driving the car that hit Lyddie. Jed’s an enigmatic and hard to read hero. He dropped out of society for a while as a teen so it’s a bit of a mystery how he got his amazing job, nice car and apartment. Tamara, who had a big crush on him when she was ten, finds her feelings all too easy to transfer to the adult Jed. But she’s just not sure whether or not he’s one of the good guys. What Tamara and Jed have in common is that their lives were changed by what happened to Lyddie. 3. I like that your books have people who struggle in them. It feels real? But what is your inspiration behind the books? It depends upon the book. Is This Love? came from me thinking about one of my old friends, a teenaged boy who suffered head injury, like Lyddie, and never got the future he could have expected. As his friends of his own age grew up and moved away, got married, went to university, he found it difficult to replace them. His family were great but it changed things for all of them, not just for him. So that was my starting point for Tamara’s family. I’m not exactly sure where my inspiration came from for Jed’s background. I have talked to a retired police officer about young men who drop out of society and find it hard to get back to normal life, so maybe it was that. I don’t consciously look for issues to drive my books. I look for quests and conflicts, more often. But issues still seem to find their way in. I suppose that if I find something that interests me I find it worth writing about, but not to the extent of letting an issue dominate a book. 4. Is there any genre you are curious to write? Romantic fiction is my love and I can’t imagine myself writing far out of the genre, although my early books were more family drama based than the books I write now. I’m lucky that I’ve found a publisher that wants me to write exactly what I want to write. I would love to have the ability to write Romantic Suspense, though. I admire the authors who can really pull that off. It’s one of my favourite genres to read. I have a book that is almost ready to hand in as a first draft, to allow the cover and blurb to be done. It began being called In the Same Boat but at the moment we like Never Own Up more. It’s set in Malta, a country that will always have a part of my heart and is about Lucas and Elle, who used to be together four years ago. Because of the meddling of Lucas’s Uncle Simon, who is still friends with Elle, they end up sharing Simon’s boat in a marina. Things haven’t worked out for either of them in the way they foresaw, they’ve changed since they last met, and there are too many unresolved issues between them to be pleased that they’ve ended up living in close quarters. It’s a reunion book. I’d never written one before but I love to read reunion books so wanted to write one. That was before I realised how much back story I had to create before I could begin! It’s almost like writing two novels. Hard work. But I’m really enjoying pitching Lucas and Elle together and seeing if they can work things out second time around. Lucas is someone who sees things in terms of right and wrong, black and white. Elle is reserved and doesn’t always spout out all the answers to his questions. It’s an interesting relationship dynamic. Since they last met, she’s left the corporate world, let her hair grow long and reinvented herself. He’s intrigued. Also, in the back of my mind is a new hero and heroine. I think I’ll be returning to Middledip village for their book. At the moment he’s called Ben Hardaker and she’s called Alexier. I got the names from gravestones. I’m particularly intrigued as to why Alexier’s name is spelled that way. I’ve only ever seen Alexia before. I think Ben is a falconer and I think he has an interest in Wicca or paganism or something. I’ll find out later. 1 copy of Is this Love? Is This Love? is out now in paperback and across all ebook platforms and has been nominated for the Readers Best Romantic Read Award. Great interview. The new book sounds fab. Right up jy street. Thanks for the joy your books bring. thanks for the nice interview, it"s a really cute book, I'm curious! Great interview Blod and Sue Moorcroft. Is This Love sounds good. I still love to travel. I also love reading, writing, Formula 1, yoga, Zumba, my family and friends. Hm, I am trying to remember but I just can't place you. Nope. Oh and a question: what should be, according to you, Ms. Moorcroft, more important in a romantic suspense novel: the criminal puzzle which is being solved or the relationship between the leads? Definitely the relationship. Every time I read a really good love story I feel as if I've fallen in love myself. The action heightens the senses and increases the stakes, I think. Thanks for the giveaway - sounds like a good book. Who is an auto buy author for you? Sounds cute. Who are autobuy authors for youi? Anything by Katie Fforde, Jill Mansell, Suzanne Brockmann, Linda Howard, Christina Courtenay, Pamela Clare. I used to read a lot of Harlan Coben and Patricia Cornwell, too, but I don't read as much crime, now. Enter me! I love reunion books, too, but I didnt' realize there was so much work in them. What are some of your favorite reunion books? Sounds like a book to add to the reading list. Thanks, Charlotte, I hope that you enjoy it. I like that this has all kinds of love in it. What a sweet sounding book. I also like that the characters feel real. Great interview. Enter me for the book, plz. Wonderful interview and I love when couples feel real and fleshed out...this sounds lovely! This book sounds like a great read. Thank you for the giveaway. I would love to win this novel by Sue Moorcroft, as i am a huge fan of chick-lit and i simply loved reading 'Dream a little dream' recently (...which was the first book i have read by this author). Thank you everybody who has commented. What a great blog! And so busy. I'm impressed. I saw on you review that you liked this book. Thank you for the giveaway and for the nice interview. Good luck to me. I love romantic suspense. Must add this to my TBR list. Sounds like an interesting book and this is one of the prettiest covers I've ever seen. I especially love the tree with heart shaped leaves. It is a great cover, Nathalie. The designer is Berni Stevens. I've loved all of Sue's books. I can't wait to read this one! Congrats to Sue on the new release! Sounds fun :) Thanks for sharing! I love that there's both romance and family love. Exploring family ties is my very favorite thing, I love these warm stories. What a beautiful book. I would love to share this with my husband. It sounds like a very interesting and touching novel. I would love to read it. Thanks for this chance. You had me at "dauntless heroines and irresistible heroes". I can't wait to read this book. It sounds really good. Now i'm interested in checking out more of your books.